I have an idea for my next tattoo design , can you help me ? Yes. Juno Tattoo Art and my Site Juno Tattoo Designs.com are my online studios of tattoo designs made to order. I have made hundreds (yes, hundreds!) of tattoo designs for people looking for a personalized and unique tattoo. 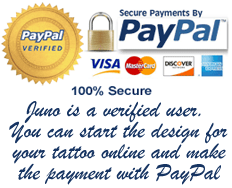 Step 6 – You receive in your email an exclusive design for your tattoo. A design just for you ! Once you receive and download your design and print it – you can bring it to a tattoo artist who then will be able to change the color to whatever you wish – he/she will also be able to re-size the design and customize it in any way you like. If there is an element of a design you don’t like, the artist will simply omit it. But we can do it in the design process because YOU and ME will work together step by step until the design like as you wish. Why I should do an initial payment for the sketches? I receive dozens of tattoo forms each week and I can’t do a sketch for free for each visitor of my website. With an upfront payment I know if this a seriously request and If you have the legal age to do a Pay Pal payment. Because you and I will work together in your design sketch by sketch until the design looks like you wish. Why I pay for a design if I can find many free designs in the web ? But… dozens of people in your city, thousands of people in your country, and millions of people around the world will have a tattoo like this. I’m a specialist in complex and detailled designs and perfect stencils. A design made by me cost $ 50 for a simple design and $ 520 for a complex and detailled full arm design, depending on the complexity of each tattoo design. Line Art or Stencil is the final design in lines only, without gray tones, color or effects, and I’ll send you each finished tattoo design with his Line Art. Then, when your tattoo artist transfer the stencil on your skin, your design will looks exactly as you wish. The designs are sold here to be applied by a professional tattoo artist in a sterile studio that meets all current hygiene standards.